Spirituality is being awake while others sleep. 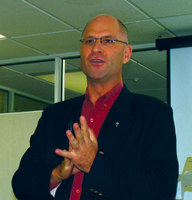 Australian priest, David Ranson, introduced listeners in Wellington to this modern interpretation of spirituality at the end of February. Years of struggle to define spirituality in a way that does justice both to the traditional and religious framework in which the spiritual life has been treated in the past have brought him to this point. For centuries, a two-tiered system of holiness operated whereby perfection was reserved for the elite who had renounced the secular in favour of the sacred. In the 20th century, however, this system was gradually replaced by a ‘new sense of inclusion, and now consecration is not seen as antithetical to a full involvement in the ordinary demands of life and of the world’. The dissolution of the two-tiered system that had been current since the fourth century challenged the nature of separation from the secular. In his search for a definition of spirituality, David Ranson has drawn on an image from Australian cartoonist, Michael Leunig, of a favourite character carrying a haversack over his shoulder. This wanderer is following his duck, which is Leunig’s representation of his soul, over a series of mountain tops which, on closer inspection, are revealed as the noses of upturned faces that are asleep. Ranson’s interpretation of this drawing is that spiritual people are those who live their lives awake while the rest of the world slumbers. David Ranson contends that it is this awakening that lies at the heart of the gospel. ‘There, though, it is our encounter with the risen Jesus which awakens us. He is the One who comes to greet us, and who calls us, “to come and see” (John 1:39). The Risen Christ, in the Spirit, continues to open our eyes and our ears, so that we might see and hear, might listen more deeply, and might perceive more fully the truth of ourselves, of the world and of the divine promise that is offered us (cf Matt 13:14-16). ‘The Risen Christ awakens us to the depth and to the height, to the entire breadth, of our humanity and our divine vocation (cf Eph 3:16-19). Our discipleship of the Risen Christ demands that we “stay awake” in constant expectation of the varied ways in which his approach is incarnated within our experience (cf Matt 24:42; 25:13; Mk 13:33, 35). David Ranson invokes St Paul to extend the metaphor to day/night, darkness/light. Paul ‘reminds us that we “do not live in the dark” for “we are children of light and children of the day: we do not belong to the night or to darkness, so we should not go on sleeping, as everyone else does, but stay wide awake” (1 Thess 5:4-6; Rom 13:11). ‘Thus, the paschal mystery finds its vitality in the way that the Spirit leads us from our slumber into a life which is fully awake. The Pentecostal miracle is the transformation of slumber, the New Testament metaphor for fear, into wakefulness, which is its metaphor for love. Fr David Ranson is a priest of the Diocese of Broken Bay, lecturing in spirituality and pastoral theology at the Catholic Institute of Sydney.